Dr John Coates discusses the study of hormone levels in City traders which indicates increased testosterone associated with success leading to tendency to take bigger risks; cyclical process: higher testosterone, bigger risks till crisis point reached; parallels in animal world. John Coates is Senior Research Fellow, University of Cambridge and former Wall Street Trader. 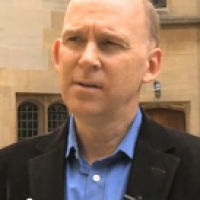 He is interviewed here before the start of the Daedalus Trust /Brain Mind Forum Research Café held 7 October 2011, Magdalen College, Oxford. “We’re studying ‘irrational exuberance’, why markets tend so regularly towards irrational risk taking. “The tendency to take too much risk and risk with bad risk/reward tradeoffs is a type of hubris. It’s the belief that you can call the market better than you can, that you’re unlikely to make a mistake and to over-reach your abilities and your risk limits.